Lismore City Council is assuring residents it is doing all it can to reduce and recycle plastics after increased community interest following the screening of ABC TV’s popular War on Waste. The second series of the program looks at plastics and how they are recycled as well as changes to the China National Sword Policy and e-waste. In 2017, China’s policy changes basically saw the country put a stop to receiving the world’s waste and governments across Australia have had to find new solutions for recycling including on-shore processing and re-manufacturing. Council is now sending its recycling to processors in Australia that require a very high-quality, clean recycling stream. “We are asking residents to help us by only placing clean recyclables in your yellow recycling bins,” Council’s Business Development Manager Danielle Hanigan said. "Individuals can also help by reducing their use of plastics in day-to-day life." Council has been promoting the use of reusable bags, coffee cups and water bottles for several years through its Choose to Reuse campaign and Plastic Free July activities. On 17 July this year, Council resolved to continue its leadership in waste and recycling by developing a policy regarding the use of single-use plastics (e.g. straws, plastic cutlery, plastic bags and water bottles) at functions, events and markets. This includes phasing out single-use plastics at events sponsored by Council or held at Council venues by July 2020. Council has also implemented technology improvements to the Materials Recovery Facility (MRF) at the Lismore Recycling & Recovery Centre to try and ensure recycling streams are kept clean. This includes installing an optical sorter to better sort plastics as well as slowing down the whole MRF so staff can pull out as much non-recyclable waste as possible. “Council is actively seeking to reduce the use of single-use plastics wherever possible,” Danielle said. Keep your recycling as clean as possible. Most things that are fairly clean are fine, like an empty beer bottle for instance, but if something has lots of food in it, please give it a rinse. Do not put anything into your recycling bin that cannot be recycled. Keep it simple: aluminium, steel, glass, hard plastic, bagged up soft plastic, paper and cardboard. Do not put anything smaller than a business card size into your recycling bin. Keep stuff like hoses, pipes and anything that has many different types of materials in it (e.g. a plastic toy with bits of steel) out of your recycling bin. Keep waste out. The main offenders are: dirty nappies, clothing, shoes and anything that can get tangled up such as rope, hose and fairy lights. Lismore is also currently working with other councils from around the region on a new education campaign to make recycling easier for everyone. 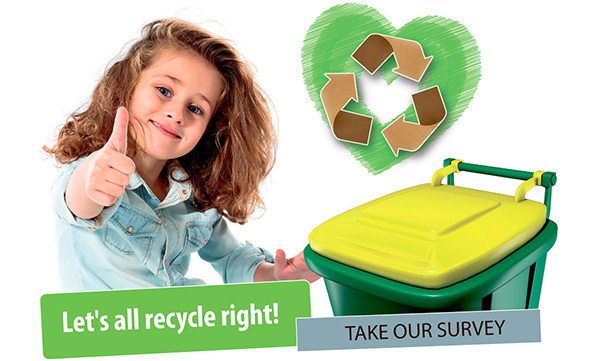 To help us understand people’s recycling habits and inform our new education campaign, please complete the North East Waste Recycling Survey at https://www.surveymonkey.com/r/Recycle_NEW.